6m / 50MHz - the MAGIC band! I didn’t get into 6m that early, in fact it took me several years after it was released as a band in the UK. I did, however, have an existing interest in VHF which made me interested in the band, although I didn’t get the equipment to operate the band until the late 1990’s. Prior to this (in the 1980’s) I had a keen interest in DXTV and used a 5 element band 1 yagi (slightly larger than a 5m 5 ele yagi) to great success during the annual SpE seasons. I logged pictures from all over Europe and into Russia. There were probably many other countries too. I would certainly like a 5 element yagi now. Back in those days I also had access to a powerful 2m and 70cm station (my step fathers shack, at the same QTH) - there were 4 x 17 element yagi’s for 2m and 4 x 21 elements for 70cm, with 400w amplifiers for each band. I have a very faded Polaroid picture of the antennas, which I will attempt to scan in. My first real experience with 6m came one June day in the late ‘90’s when I decided to build a home brew antenna for the band, having just purchased a shiny new Alinco DX-70 HF/6m radio. I measured out a quarter wave length of wire and attached it to the centre of the coax forgetting it was attached to the rig. As soon as I connected it I heard an EA beacon (by pure fluke I was tuned to a beacon frequency), I nearly fell off my chair as I was holding a length of hook up wire in my hand, with most of it draped on the floor listening to a beacon in Spain on 6m! That did it, I was hooked!! Fast forward a number of years and here we are now, with well over 100 countries under my belt, still just as hooked on the magic band AND still using an antenna made of hook up wire!. Decided to give up with the parallel dipole as it was noticeably down on the OCFD. Instead, for 2016 I have concentrated on minimising losses. I’ve replaced the feeder on the OCFD from a piece of RG58 joined to a length of RG8x mini to a single, shorter, run of good quality RG213. The 6m dipole has been replaced with a ’Royal’ Discone (supposedly covers 25-2000MHz, with TX on 6, 2 and 70cms, however the SWR on 6m is too high for the internal tuner to handle (as it is only just over 3.5:1, I think it is a complex impedance causing problems), fed with a single run of Westflex W103, instead of a much lengthier run of RG213. I’ve had a few noise issues which I am slowly rectifying, but overall I am reasonably impressed with the performance of the Discone. It is able to hold its own on 6 and 4m, plus it works well on 2m repeaters. I am hearing repeaters under flat conditions now that I have never heard before. Ideally I would like to get my Triband ‘White Stick’ vertical on top of the mast, but I don’t think my neighbours will tolerate that. The OCFD still has the edge on 6m, mainly because it has some gain and is at least partially horizontally polarised. For the majority of DX on 6m (and it is also useful on 4m), the HF OCFD is better, and is easily tuned on the 6m band. So, latest progress in readiness for the 2015 Es season. The OCFD is currently at about 6m up, I am hoping to raise that a further 2m or so, just so that it is as far away from house noise as possible. There are now 3 antennas that will resonate on 6m: A 6/2 and 70cm vertical in the attic, a wire dipole and the HF OCFD. Both the OCFD and the dipole are on the same axis, in fact the dipole is clipped on to the OCFD at the moment, but I am hoping to change that by making the dipole into an inverted Vee. In addition, I have a 6m preamp which helps with weak signals on the low noise OCFD. The OCFD seems to have some gain on 6m as it is several dB stronger on most (but not all, a few have been stronger on the dipole) signals than the dipole. The advantages of this, for me is having two lower noise 6m antennas, one is connected to the FCD and the other is on the IC756pro. I use the 756 for making QSO’s (doesn’t happen that often but I do make some QSO’s if it’s a needed, or special station), or it is in use for JT65 and JT6M, while the FCD is used for monitoring and DXing (it is very sensitive, certainly more sensitive than the 756). Update: Since purchasing the Fun Cube Dongle Pro Plus (FCDP+), I have experimented with it and have now decided that it is to be my main VHF receiver. Being able to see the whole of the ‘interesting’ part of 6m in one go has paid off this season. I have been able to spot very brief openings and pounce on the signal before it faded out. I have still made use of the IC756pro on 6m, that is now monitoring the digimode segment, in particular 50250 for PSK31/63/125, and RTTY. For the specialised modes such as JT65, FSK441, JT6M and JT9, I use the FCDPP feeding a virtual audio cable (VAC), into a suitable decoder program. The beauty is that I can run multiple VFO’s within the 192kHz span of the FCD, each feeding it’s own VAC (which appears as a selectable sound input source) and each feeding a separate decoder (or headphones/speaker). I can even feed the audio to the left/right or both channels of my headphones (so I can have 2 signals, one on each VFO fed to each ear - say 1 CW and 1 SSB, or a DX station with a split pile up for example - DX in one ear, pile up in the other). Such flexibility, it gives DXing a whole new perspective! The transceiver is an Icom IC-756pro (mk1), which gives 100w on 6m and has IF DSP on receive. I run the 756pro with both pre-amps on when using 6m, and the antenna feeds into the MFJ1026 phaser which also adds a few dB to the signal, but more importantly allows me to remove some of the local noise that plagues most of us. Even with all that running, I have a background noise level of between s0 and s2 (although that can rise to s4-5 when all the local neighbourhood tv’s/pc’s/consoles etc are running. With careful twiddling of the MFJ, I can reduce this back down to s1-2. In the middle of the day, my background noise level is about s0 (i.e. no indication on the s-meter, and I count myself very fortunate indeed to have this). Even with QRM/EMC s1-s2 is a pretty good background noise level and does allow me to hear some pretty weak stations. Also new in the line up is a Datong FL2 audio filter, which are considered to be up there with the very best of the analogue audio filters. Certainly it is a real boon on weak CW signals. Update: I have since replaced the Datong FL2 with an MFJ 784B programmable DSP filter. Very impressed with it and at a real bargain price (in fact the Datong sold for roughly the same as the MFJ cost me. Now that I have managed to get my HF Off Centre Fed Dipole up on a mast at about 7-7.5m, I thought I would see how it plays on 6m. In a word - great! SWR is about 1.7:1 so perfectly usable without an ATU. The OCFD is very quiet on receive. So quiet in fact that I have purchased a shack 6m preamp. The Spectrum Comms RP6s preamp is RF switched and has up to 20dB gain, with a 1.5dB noise figure. It’s giving a good boost to the signals without adding much in the way of noise. A ‘proper’ outside 6m antenna is not likely to happen here so this is the best compromise. If I can work ZS on 6m with it, it can’t be too bad! Now to give a little more flexibility to my operating, I have installed a wire dipole suspended below the OCFD and fed with mil spec RG213 - as shown above. This has an SWR of 1.5 over the frequency range of interest. I use the dipole for monitoring with the FCD and the OCFD is on the 756 and runs JT65. So far, the results have been really good. Guadeloupe and Puerto Rico on JT65, and plenty of interest on the other modes too. The 6m dipole is also pressed into service on 4m, where it has heard as far as the Canary Islands. I have purchased a ‘Netsky’ DVB/T DAB USB dongle from eBay (where else?). There is a lot a interest in this very cheap little device (mine cost under £12) as, with the right driver, it will transform into a wideband VHF/UHF SDR receiver. There are several on the market but you need to make sure you get one that is fully compatible with the driver, so you need to look for an RTL 2832U chip coupled with an E4000 tuner. This combination will allow reception from about 60MHz right up to well over 1GHz. I’m pretty impressed with mine and have used it to good effect on the 4m band (70MHz). It would be great if it covered 6m as it would be possible to see an opening as it happens (forgot to mention, the visible bandwidth of the dongle is a massive 2MHz - more than enough to cover an entire band such as 6m, 4m or 2m - it will even display upto 3MHz at a time but that is pushing the simple hardware to it’s theoretical limit and the results are not brilliant when demodulating audio). Also being an SDR, the software allows the filtering to be customised to whatever bandwidth is required - on the FM broadcast band I open it right up to the maximum 250kHz for local stereo reception, but have reduced it down to less than 60kHz when there is a weak signal hiding under some splatter. Now, an update to this: In March 2013, I added a second RTL dongle, this time with an R820T tuner instead of the E4000 of the other dongle (and it was half the price, including a magnetic antenna! £6 including shipping is a steal). The R820 based dongle covers down into the HF portion of the spectrum, but where it scores points over the E4000 is at UHF. The R820 is noticeably more sensitive at these frequencies, and has an extra 7.5dB of gain available in the RF amplifier. I have the R820 dongle connected to a 1.09GHz 1/4 wave ground plane antenna (in the attic) for monitoring ADSB transmissions from aircraft. Even with an antenna that, in total, is less than 15cm (6”) long, I am able to decode the ADSB signals from aircraft that are up to, and over, 275km (150nm) from my QTH. For 2013 I decided that I would like to do more on the VHF bands, so treated myself to a FunCube Dongle Pro+. A superb SDR receiver the same size as the Netsky but with a much, much better receiver inside. The FCD pro+ covers from 150kHz up to about 2.1GHz, with a small gap around 250-350MHz due to the architecture of the devices used. This is no problem for me. The FCD Pro+ is the 2nd generation of the FunCube Dongle, the first one being of a similar, but better design, as the Netsky dongle. The new version of the FCD has proper front end filtering with 11 bandpass filters and SAW (Surface Acoustic Wave) filters for 2m and 70cm and a good LNA (Low Noise Amplifier). Some people use the FCD with a pre-amp into a good antenna system for monitoring very weak signals. This is a bit beyond me as I don’t have a proper ‘gain’ antenna for the VHF bands. I am hoping to move my Triband vertical colinear from the attic to a position in the garden, it will be lower but it should be less noisy. I have found that, for the most part, my 6m sloper is the best compromise antenna, it gives best SNR (Signal to Noise Ratio) on all the VHF bands and I can now hear things under ‘flat’ conditions that I have only ever heard when there has been a tropo ‘lift’. The FCD allows you to see a 192kHz ‘chunk’ of spectrum at a time, which is enough to display the 2m ssb and beacon allocations or the whole of the multimode and beacon portions of 6 and 4m. Incredibly useful for seeing lift conditions or SpE/MS pings. During the SpE season this will be doing a lot of the donkey work and hopefully I will not miss much. Using the right SDR software package for you is important. There are several that support the FunCube Dongles to a greater or lesser extent, some are tailored for a specific type of use, whereas others are more suited to general use. My favourite (at the moment) is SDR Sharp (aka SDR#). This is a useful, free, program that has a number of feature I use regularly. One of which is what they term a ‘Frequency Manager’. You store and customise frequencies for instant recall. I keep a whole host of different frequencies, each one tailored with it’s own mode and bandwidth settings. I can go from broadcast MW, to a time/frequency standard signal to a 6m/4m/2m beacon to FM broadcast stations, airband or 70/23cms at the click of a button. So very useful for checking conditions, I can asses all the bands of interest in the matter of a couple of minutes. Here are a couple of tables that I made from testing both dongles. These are not SNR readings in the ‘proper’ sense, but are still valid for this. What I did was to use the dB scale on the SDR# graph and read off the corresponding peak. To establish the noise floor of each device, I unplugged the antenna and measured the background noise on the SDR# graph, I repeated this once for each band of frequencies I tested to establish the noise floor on each of those bands. The I conducted background noise tests with the antenna plugged in but on an unoccupied frequency, in the same manner as above. After the noise level was established for each antenna, I then tuned to specific frequencies and took the measurements using all three antennas with the FCD connected, and just the sloping dipole with the RTL dongle (it was pointless doing all three antennas, I just chose the quietest one to do the like for like comparison). As you can see, the Netsky/RTL dongle has a no antenna noise floor of -52 to -55dB, dependent on band in use. Compare that to the FCD pro+ that has a no antenna noise floor of between -87 and -90dB! That is immediately a 35dB advantage over the Netsky. 35dB is almost 6 s-points (or to put it another way, the FCD has a noise floor of about 3000 times lower than the Netsky)!! The Netsky tries to make up for this shortfall by having a (mostly) higher overall gain than the FCD. The second table shows a more detailed comparison between them. background noise level, no signal & away from centre spike. Vertical: Triband White Stick for 6, 2 and 70; 1.5m long; in attic. Measurements taken using SDR#, with FCD sampling rate 192kHz, software in CW mode with 200Hz bandwidth, except for Band 2, where FM mode was used with 80kHz B/W. These tables may not be that easy to interpret but the net result is that the FCD pro+ has a much lower noise floor, which means that even if a signal is a little weaker than it is on the Netsky, the overall SNR is much better. The Netsky has more gain at certain frequencies but a much higher noise floor which masks weaker signals completely. For the small asking price (about £12/15 Euro/$20 or so), the Netsky does a great job, and having a 2MHz sample rate means that the whole of the 4m/2m band can be seen at once. I shall be using both dongles as the Netsky does receive TV and DAB transmissions, but the FCD does not. £150 is not a lot in reality for such a high performance SDR - my SDR-IQ costs over 3 times that amount and stops at 30MHz. Yes, it is a better receiver, but not 3 times as good :) I won’t be getting rid of the SDR-IQ either - that has LF/HF work to do. Now that I am getting more interested in VHF, I thought I would try my hand at decoding signals from the NOAA weather satellites that are on the 137MHz band. Now it has to be said that I do not have the best antenna for this kind of work - in fact it is probably nearer to being the worst kind of antenna! I use my 6m sloping dipole at the moment. Ideally I should be using an antenna that has circular polarisation, something like a ‘turnstile’ or a ‘QFH’. Both of these are used by weather satellite enthusiasts. The FCD is a great receiver for this as the bandwidth can be set to the 40-50kHz necessary to decode the finer detail. A scanner, such as my Yupiteru cover these frequencies but their bandwidth is usually fixed at about 15kHz in Narrow FM mode (180kHz, or more in Wide FM mode). This is too narrow and the software will remind you of this fact! I will attempt give a ‘beginners guide’ to decoding the NOAA satellite images. I say try because, I too, am a beginner, and have fumbled about until I managed to get a decent decode! Luckily it is not difficult to get up and running. The things you need are 1) a receiver that covers the range of 136-140MHz in FM and, preferably, has a fairly wide IF bandwidth filter. 2) A method of getting the audio output from the receiver into the decoder software. For a traditional receiver, you would use a jack lead from the headphone or line out socket (if you have one) into the line/mic in on your computer soundcard. For SDR’s you need to use a virtual soundcard program which mimics having a second soundcard and physically linking them output to input. 3) Decoding software to process the audio into images. 4) An antenna capable of hearing the NOAA satellites. I have managed to purchase a suitable antenna (it is actually a 4 element crossed yagi for the 2m band, complete with phasing harness to give the circular polarisation required for the satellites. Instead of using it as a crossed yagi, I will be using just the driven element and the reflector and standing the antenna on it’s end, so that it becomes a 2 element omni-directional turnstile. (meaning I do not have to try and track the satellites with a rotator). This will mean a compromise in signals (as will the fact that it will be in the attic, for the foreseeable future at least). I am hoping that it will give some reasonable weather maps during high passes - also I may be able to hear some of the amateur 2m satellites and the ISS (International Space Station). I will be including some of the decoded images from the NOAA satellites. I have been pleasantly surprised by the quality of the images I have decoded. Obviously a lot depends on how well I can ‘see’ the satellite, how high it is in the sky, and what area it is imaging. I can get images of all of Europe and sometimes into Western Russia, plus down to North Africa and out into the Mid Atlantic, going West. This would be much better if I had the antenna mounted outside and above the ridge of the house but it is doing well for its current location. I acquired (for free) a Sony ST-S311 hi-fi tuner for FM band dx-ing (previously, it was an ST-S370 tuner which was not as effective). I have modified this by replacing the standard IF filters with 3 x 150kHz ceramic filters in the ‘wide’ setting and 1 x 110kHz in the ‘narrow’ setting. All these filters are made by Murata and make a very big difference to the amount of adjacent channel splatter heard. So far I have heard SpE signals on Band II FM from Portugal, Spain and some East Europeans although, to be fair, I am usually on 6m during these openings so I don’t often listen up that high! The only trouble with the narrower filters is that RDS can sometimes be a bit hit and miss with weaker signals, but I have managed to decode a few from the continent. 15th May was the first time I was able to get on seriously this season and I heard some Italians and Spanish on Band 2, one was strong enough to trip the RDS, which was very handy for ID purposes! I do expect to retire this unit at some point as I think the SDR devices will offer superior sensitivity and will certainly offer much better selectivity. I have acquired (again, for free!) a Yupiteru MVT-7100 scanner that covers from MW right through to 1600MHz in all modes and the 6m sloper works very well with this scanner. I can monitor the 6m band, SW broadcast, the HF, VHF and UHF ham bands and FM broadcast amongst others . What this gives me is an early warning system for Sporadic E events, I can monitor known beacons/stations and be ready to move to 6m as soon as they become audible. Also, for the first time I can monitor the 4m (70MHz) band and the East European/Russian OIRT broadcast band that runs from about 65MHz upwards, plus of course the 2m ham band on SSB. On 15th May, I logged my first SpE signals on 4m, a YO2 from Romania! The antenna was my band 2 yagi, so it is pretty poor this far below it’s design frequency. I have a couple of antennas to choose from at the moment, plus I have just purchased a triband vertical ‘white stick’ type antenna for 50/144/432MHz, which I hope to install in the attic in the next few weeks. This should give decent coverage of the frequencies I am interested in. I can use the 6m sloping dipole which, being in the open and well away from the shack, is a pretty quiet antenna and works well on 4m/70MHz. It is also quite effective on the VHF FM broadcast band (87-108MHz) as it has a lower noise level than the attic yagi. For the VHF FM broadcast band I have a dedicated 5 element yagi, which I have chosen to mount in a vertically polarised position in my attic. Space constraints prevent me from being able to rotate the yagi, so I have aligned the front lobe approximately South East, which should give me reasonable coverage of most of Southern/Eastern Europe. Being in the attic and only about 8 feet away from the shack means that it picks up quite a lot of noise, but the signals from the main lobe area are quite a lot stronger than with the 6m sloper (as you would expect). I did try the yagi in horizontal polarisation, but most signals were way down (most of the ones I was interested in at least), although some were stronger. Keeping it horizontal would probably be the best for DX but I couldn’t hear the stations that I like to listen to well enough to consider keeping it that way. Obviously it is a function of the radiation patterns that causes these odd phenomena to happen and I have decided to compromise rather than get frustrated trying to get the best of all words. Because of the updated equipment in use I have had to make some changes to my antenna system (there is not enough physical space to have all the antennas I wish to use). For now, at least, the 5 ele FM yagi has been dismantled. It’s place inthe attic has been taken by the Triband (6, 2, 70) white stick, similar to the one shown above. Although it is fairly noisy it does give better frequency coverage than the yagi, and it works very well. I am hoping that I can mount this outside at some point, away from the house and about 10 feet up. Not very high at all, but as it will be in the clear it shouldn’t be too much of a problem. This should bring the noise level down and improve the SNR. Strangely, I have found that the best all round antenna for VHF is my 6m sloping dipole. It is a quiet antenna and seems to give good results on all bands from 6m through 4m, FM broadcast, Airband. weather satellites and 2m. It may even work on 70cm but the long run of RG58 coax (about 20-25m) will be so lossy that I’ll be lucky to get anything! I was surprised yesterday, when I forgot to change the antenna and listened on 10m, with the FCD and 6m dipole and I heard VP8LP in the Falkland Islands, very clear and although not very strong was 100% copy. Also heard some of the stations calling him too. So it is proving to be a versatile antenna that cost nothing to make (I had all the bits in my junk box already). When/if I get the tribander outside, it will be using a much lower loss coax, and over a shorter run (I think, no more than 15m). Yupiteru MVT7100; Sony ST-S311; RTL E4000 & R820T based SDR dongles; FCD Pro+; Roberts R861; Roberts R9914; Degen DE1103; Icom IC-756pro. 50MHz half wave sloping dipole at 9m above ground; 20m long OCF dipole at 10m above ground (for 10m); 5 element Band 2 yagi in attic; 50/144/432MHz vertical, approx 1.5m long, in attic (for now). Various telescopic whip antennas. 9 June 2010 - 6m opens Eu/UK to Japan! For the better equipped stations in Europe and the UK a few Japanese stations were worked, for me I just about heard the strongest one (and that was a very scratchy, marginal copy - the odd letter here and there - so yes I did hear Japan but in all honesty it would not been enough to identify the station had I not known (I could hear the station he was working, so knew it was the JA responding). I am hoping that I will hear a stronger one that I can record this season, but I am astonished by the propagation that 6m is producing at the moment - and this is not even F-layer propagation, we need to wait another year or 2 for that to happen, then the world will open up (so I am lead to believe!). The new ones which took me to the DXCC were: ST2 (Sudan), TR8 (Gabon), A71 (Oman) and SV5 (Rhodes). I was surprised by how strong the ST2 was at one point, although it took a fair amount of waiting before I actually heard him. I watched the DX cluster for spots from G stations and then tuned on to his frequency and monitored - and while I tuned elsewhere I checked back every couple of minutes. Eventually I was rewarded with a signal, which remained audible for over an hour. The A7 was very weak, I did record it (as I did with the ST2) but I have yet to check it to see if it is audible on the recording! I am hoping this season will be a good one as I missed out last year and the year before due to defective/inefficient antennas. The openings seem to be very long at the moment, yesterdays opening was going before I got up, and was still going after I went to bed! It certainly seems to have got off to a good start. These long openings enabled me to log 44 DXCC in 3 days (which is more than I have logged in some whole years!) and now, barely a month in to the season and I have 64 DXCC in the log (this is including the JA mentioned above, although some would say that it doesn’t count as I didn’t hear the callsign etc. - well as I am not applying for any awards or contests it doesn’t matter, I know I heard it and that is what matters to me ;-) The final year total for 2010 on 6m was 70 DXCC in 252 grid squares. Looking back through my log, I have logged the USA 100 times on 6m (I have only logged a station once per mode per year) with the furthest West being Western Texas. So far I have logged 24 out of the 50 US States (or 48 if you discount AK and HI). - the best year, by far, was 2006. I have logged the USA on 6m in 2001, 02, 03, 06, 07, 2010, 11 and 2012. In the next 3 or 4 years, there should be some F2 propagation which will, I hope, open up the more Westerly reaches of the USA and further afield. I really need Australasia/Oceania on 6m to complete my WAC! Because of it’s nature sporadic E (Es as it’s commonly known) is just that, sporadic! It can pop up at any time but there are warning signs to a possible opening. If you know what these are, you can be prepared, rather than being caught ‘on the hop’. The exact science of Sporadic E is still not fully understood, but it appears to be related to high altitude wind shear creating areas of intense ionization. I have found that SpE has a habit of being around when thunderstorms are in the locality - why this should be I don’t know but it happens quite a bit in the summer. The link between thunderstorms and SpE has been dispelled, but I’m not so sure (maybe the ‘supercell’ thunderstorms create enough high altitude air/friction (and also voltage polarity movement) to cause this shearing effect - I’m not a meteorologist so this is just speculation on my part! It’s always worth checking 6m (50MHz), 4m (70MHz) (if you have the capability/license) and 2m (144MHz) during May, June and July (April, August and September do produce Sporadic E, but not as often as May, June and July). If possible monitor the DX cluster for reports, also monitor 15, 12 and 10m for short skip stations from a few 100km. If you begin to hear those and they are strong, the chances are 6m will open up soon. If the signals on 6m become very strong and the distance, try 4m (70MHz) (if you have it). Also keep an FM radio to hand to check the progress of the MUF. If you start hearing strong foreign stations on the high end of the FM band (100MHz or above), then it’s time to warm up the 2m rig. Also use the real time web-based monitoring systems, such as DX-Sherlock, which can be found at www.vhfdx.info. 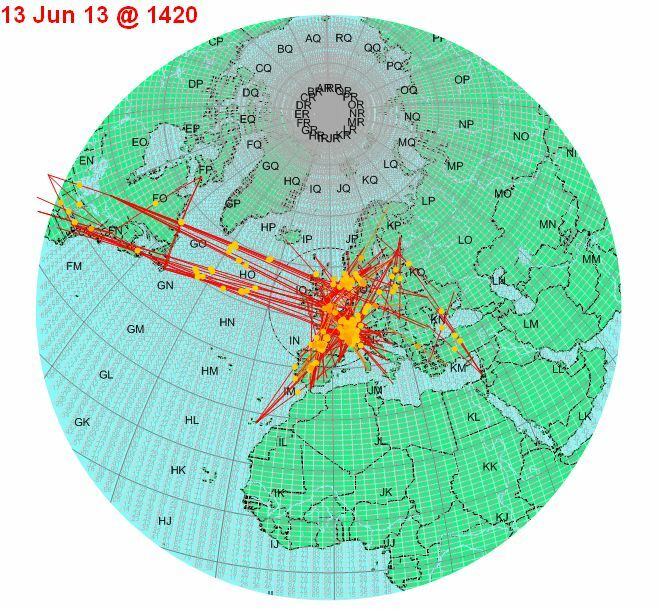 This shows real time activity on any of teh VHF.UHF bands by collating data from DX and web clusters. Also on that site is a real time MUF map which plots the predicted MUF based on real data which is then computed by mathematical models. If you see MUF’s of 50MHz, or higher, over the middle of France (for example) or similar distance (500-1000km or so), there is a very good chance that signals will be heard on 6m. Keep your ear out for G stations working Europeans, if you can’t hear any don’t worry as there is a good chance that the cloud may come within your range at some point. It is not unusual to hear a local station to you working very strong stations you cannot hear, this is part of the fun (and frustration) of Sporadic E propagation. If you have a beam, start off with it pointing South East, as that is where the majority of Sporadic E comes from. Sporadic E tends to be very localized and a station just a few miles away may receive something at s9, whereas you cannot hear a thing! Sometimes the reverse is true of course, so stick with it and your turn will come. High power is not necessary, just a few watts and a simple antenna will get you contacts. A horizontal beam is preferred for the longer distance stations, but not always necessary. Be prepared for short snappy QSO’s, particularly on 2m where the openings are much shorter than 6m (only a matter of a few minutes to perhaps an hour or two, where 6m can be open most of the day and into the night). A typical Sporadic E QSO consists of callsign, report and QTH locator (sometimes known as QRA locator). You may find that on occasion names and brief equipment details are passed, but usually the operators are trying to work as many stations as possible in the opening and you won’t make too many friends by passing on your life history during a Sporadic E opening!! Using a vertical antenna for this type of DXing (although the real 6m operators wouldn’t class these signals as DX!) is that signals can be heard from all round the compass. The disadvantage is that you can end up with multiple signals on the same frequency at the same strength. I think the best combination would be a vertical for general ‘sniffing around’ and a beam for ‘homing in’ on a weak signal. A 5/8th wave vertical mounted at around 10m or more and in the clear will work very well and is not too big at under 4m long. A 3 to 5 element beam mounted about 3m below the vertical will give a good account of itself, giving you up to about 6dB gain (or more if you believe the manufacturers!) over a dipole. 10w into the beam will give you an erp (effective radiated power) of 40w, which is a useful amount of power on this band. Run 25w and you get an erp of 100w (the equivalent of feeding 100w into a half wave dipole). Even with the vertical you will get an erp of 20w for your 10w input — ideal for foundation licensees (come on you M3/M6’s!!). For sporadic E these power levels are more than enough, it’s amazing the signal levels that can be heard when the band is open. An interesting twist this year has been the extended openings to North America and the Caribbean, presumably by some kind of E-layer propagation. These openings on occasion have been hours long and stations in the UK have reported s9 signals for hours on end from all manner of exotic DX. For me, the signals haven’t been that strong, but certainly strong enough to record. Between 0700 and 1000 on some days even better DX had been worked, namely Japan! I’ve not been lucky enough to hear one of these yet but I am hopeful that I will soon. It’s this kind of DX that makes 6m such an intriguing band and why it has such ardent followers. I for one have been ‘living’ on 6m this year, and have enjoyed the DX but much the same as our British weather you can never tell what tomorrow will bring, maybe a new country or maybe the band will be closed. To see your signal meter stay over ‘s9’ for extended periods is pretty common and some of these stations are running low power and simple antennas (like 5w from a mobile into a whip on the roof of a car—one of those was on from Italy yesterday and was as strong as the base stations!). Sporadic E is great fun in the summer and you can work stations running almost no power and not much of an antenna. Make hay from May to September, and possibly a little in November/December because the rest of the year could be quite bare! I have tuned for months without hearing a signal on 6m. This is where the dx cluster comes into it’s own. It’s like having a few thousand ears all tuning around at the same time. With that many listening there won’t be many openings that don’t get reported. I have the cluster running most of the time, if I am at the radio or not. As soon as I see/hear spots for 6, come up I check out where they are from. If they are from the near continent then chances are we will get an opening sometime soon, but if they are spots from much further afield there isn’t too much point in getting excited! This can of course change given the right circumstances. Click the thumbnails below to see full size images of where I have managed to hear on 6m using just a single element antenna (these are a little out of date now - I will update them after the main 2014 Es season has ended). Use the back arrow on your browser to return here. I have now achieved DXCC on 6m - in May 2010 - ST2AR (Sudan) gave me the last country I needed! AALAND ISL. ; AUSTRIA; BAHRAIN; BALEARIC ISL; BELGIUM; BOSNIA; BULGARIA; CANARY ISL. ; CORSICA; CRETE; CROATIA; CYPRUS; CZECH REP; DENMARK; DOMINICAN REPUBLIC; ENGLAND; ESTONIA; FAEROE ISL; FINLAND; FRANCE; GERMANY; GIBRALTAR; HUNGARY; ICELAND; ITALY; JAPAN; LATVIA; LITHUANIA; MALTA; MOROCCO; NETHERLANDS; NORWAY; POLAND; PORTUGAL; PUERTO RICO; QATAR; PALESTINE; RHODES; ROMANIA; SAN MARINO; SARDINIA; SCOTLAND; SERBIA; SHETLAND ISLANDS (WAE); SICILY (WAE); SLOVAK REP; SLOVENIA; SPAIN; SWEDEN; SWITZERLAND; TAJIKSTAN; TURKEY; UK BASES IN CYPRUS; UKRAINE; UZBEKISTAN; WALES. Reserved for Intercontinental traffic (SSB on/above 50110) - no Eu-Eu etc. Intercontinental Calling Frequency (CW or SSB), do not use for QSO’s and do not use for calling inter-Europe! Once QSO has been established, QSY to clear frequency as soon as possible. Here are some MP3’s of interesting stations/beacons that I have heard on 6m. I will add more as and when I hear them. All signals below were received using one of the following antennas: Wellbrook ALA1530 (1m diameter active loop) at 4m; 6m/4m fan dipole in attic. Recordings vary in quality and volume! I have arranged the MP3’s by continent to make it simpler to find one of interest. Where there are multiples of the same station, they were recorded at different times, sometimes even on different months or years. I will, in the near future, be trying other formats, such as WMV, OGG, etc, as some people have trouble playing mp3 files. EY8MM (Tajikistan), not edited yet. Here are some screen shots from G7RAU’s ‘Live MUF’ software showing the directions of SpE openings on 6m at various times over the past couple of seasons. These plots are taken from actual spots on the DX cluster with the lines indicating possible paths from my QTH. Some of these are generated from spots I have entered onto the cluster. These show, quite clearly the average distance of single, and in some cases, double hop paths and also show where the Sporadic E cloud is located (the points where there are concentrations of yellow dots).